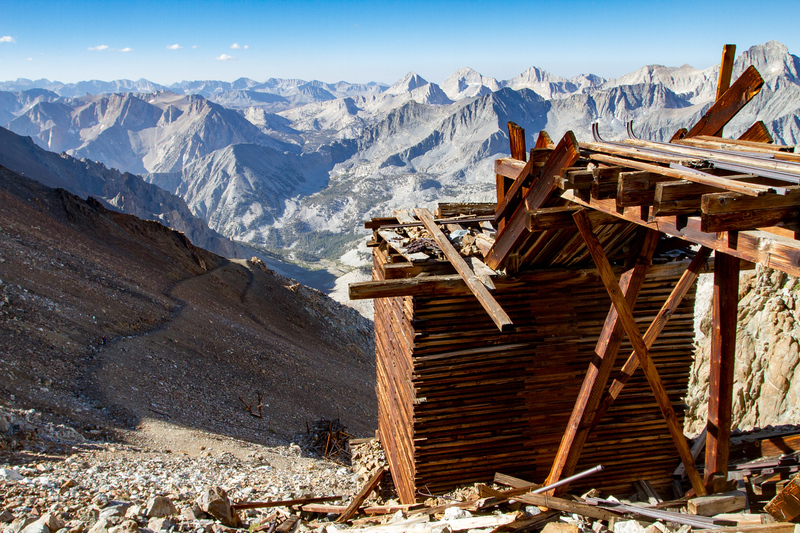 At 12,990 ft, the Adamson is the highest mine in the Sierra Nevada. And as you might suspect, getting there is no easy feat. 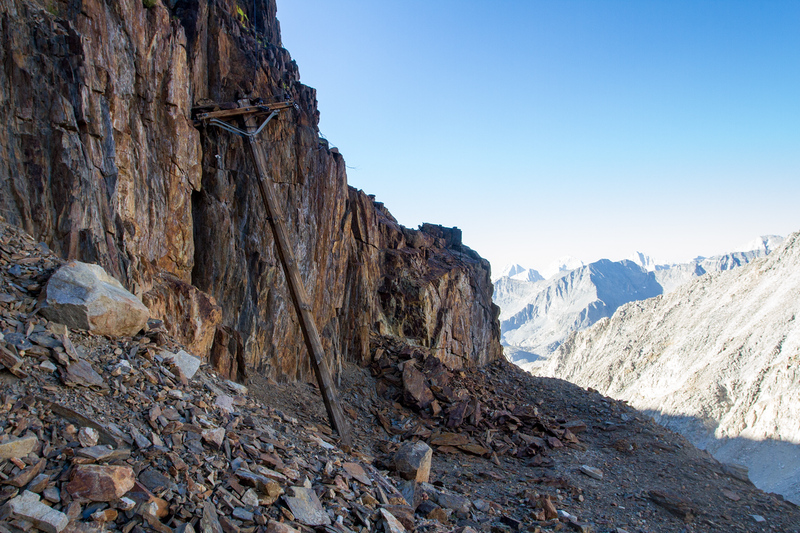 It is a strenuous 8.6 mile (one-way) and 3,670 foot climb up the rugged Wheeler Ridge to reach it. 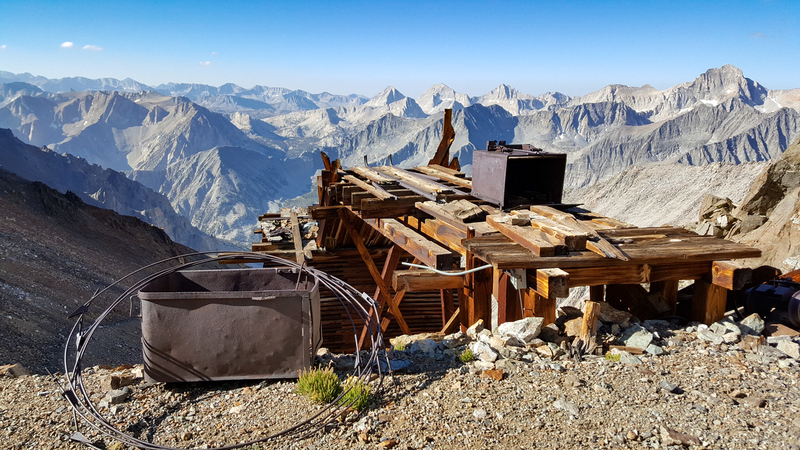 This is the top of the Sierras. 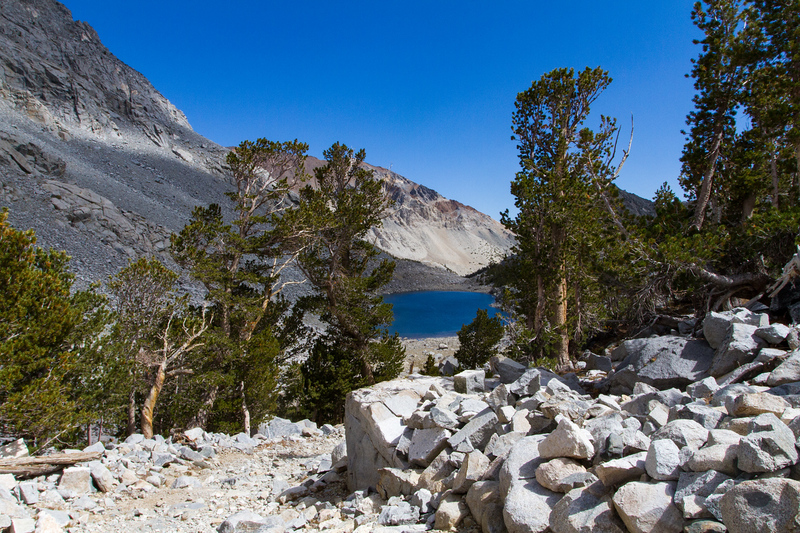 Altitude sickness is a real concern here so be aware of headaches and fatigue. Turn around and head down if you feel sick. 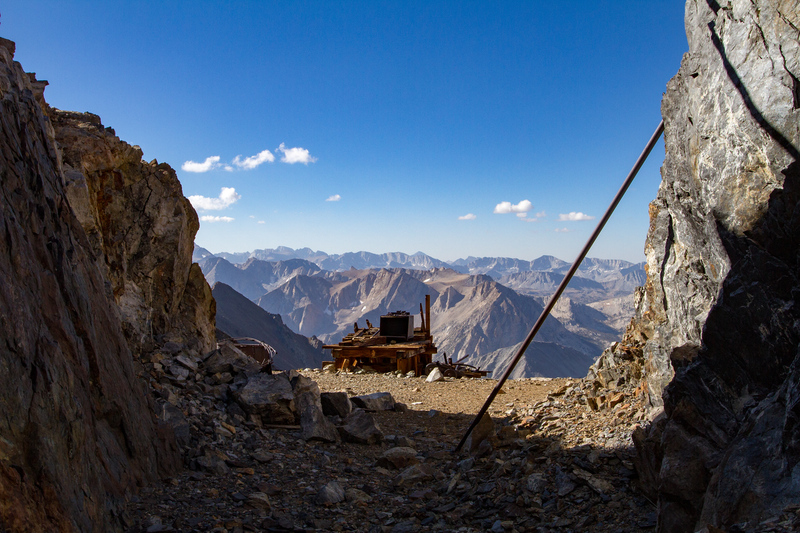 Those who do make the climb are rewarded with some impressive views. 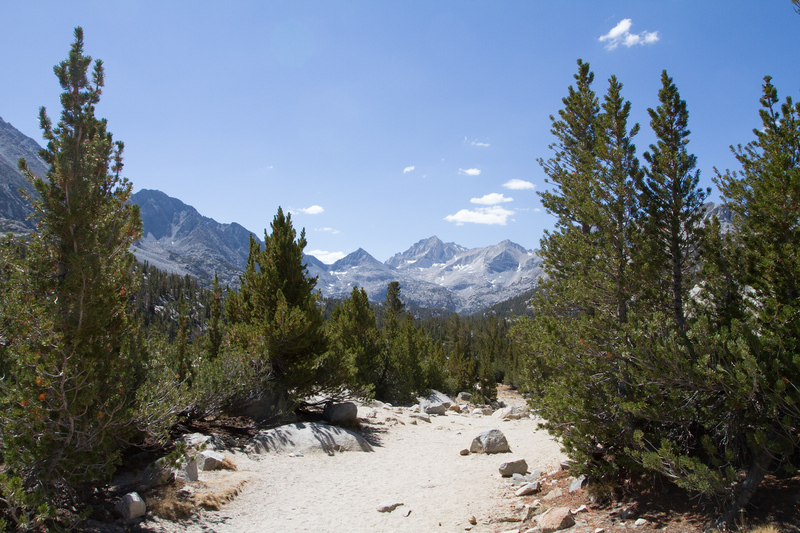 Off to the west is the John Muir Wilderness; a vast and jagged expanse of forbidding rock and ice. 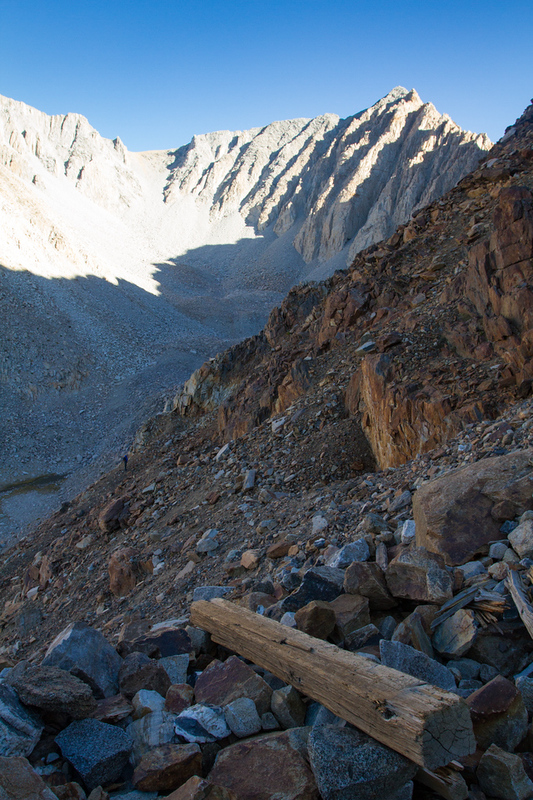 Turn towards the east and the massive chasm of Owens Valley opens up before your feet. 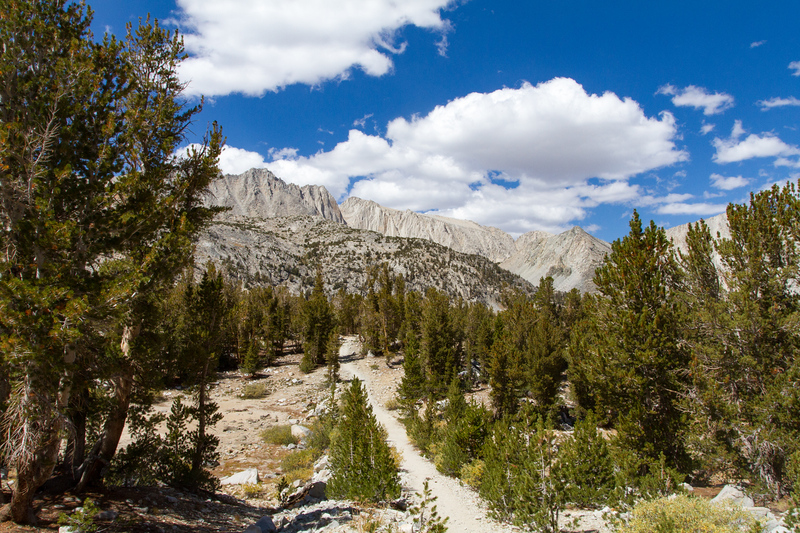 Only a few miles away but 8,800 feet below, the town of Bishop sticks out like a verdant oasis in the dry valley. 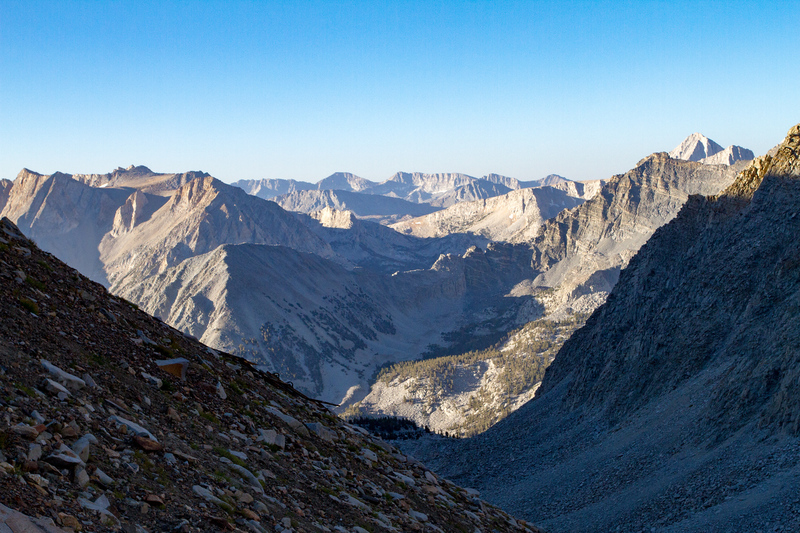 And at 14,246 ft, White Mountain Peak crowns the White Mountains off in the distance. 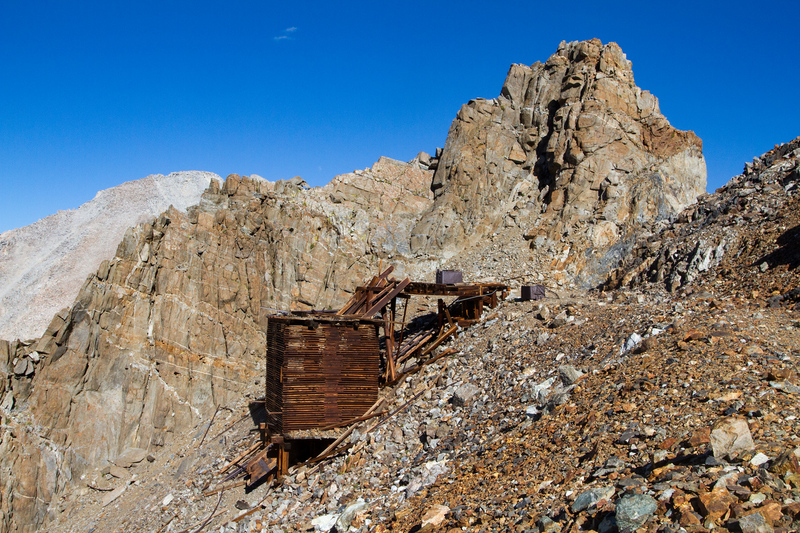 The mine itself is divided into the lower workings at 11,600 ft and the Ridge Body, an amazing 1,400 feet higher at nearly 13,000 ft. It sits right on the ridge. 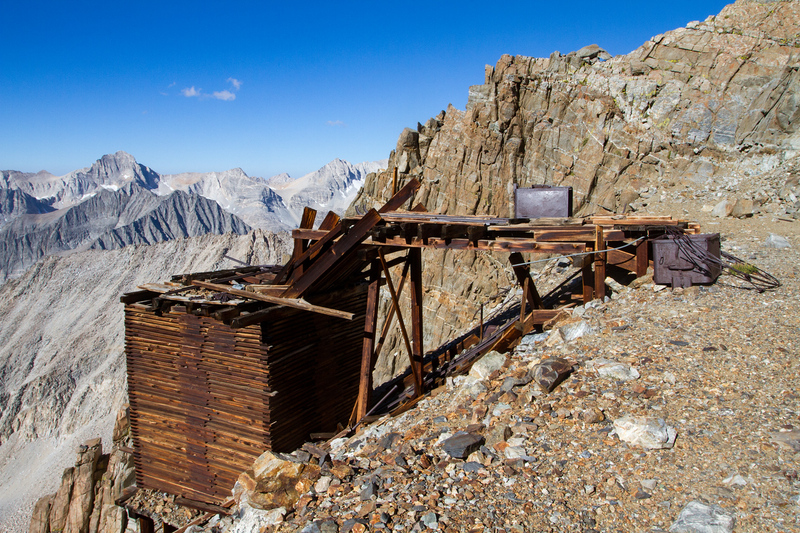 Originally named the Bluebird Claim, Clarence Adamson discovered this mine over a hundred years ago in August 1916. He transferred the claim to his brother Don but little work was done on it. The Panaminas Company leased the property in 1941 and developed the high-grade tungsten ore throughout WWII. During this time a mine camp was developed. 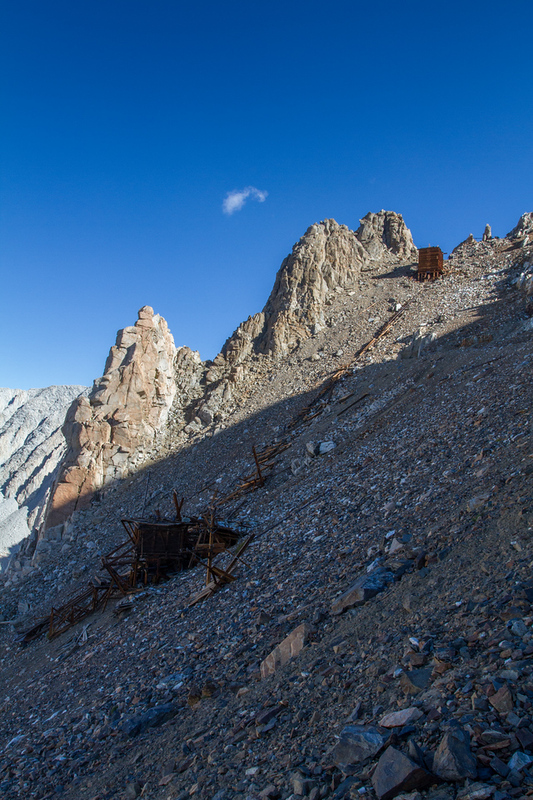 A tramway and a few buildings sat at the base of the ridge next to the lower workings. 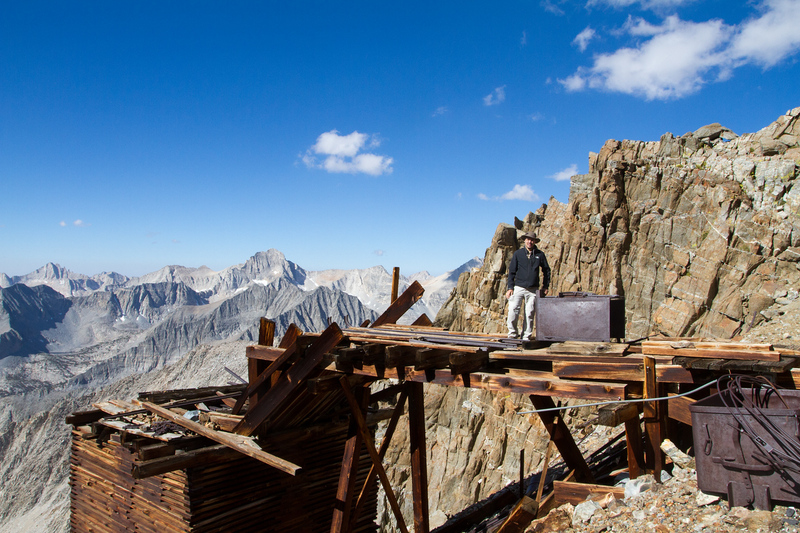 Unfortunately, the camp was destroyed by a snow avalanche in February 1945. Luckily though, the mine was closed at the time and no one was injured. It was never rebuilt. For more history of the Adamson and the nearby impressive Pine Creek Tungsten Mines, pick up Mine in the Sky by Joseph Kurtak. Long out of print, it is the authority on these mines. 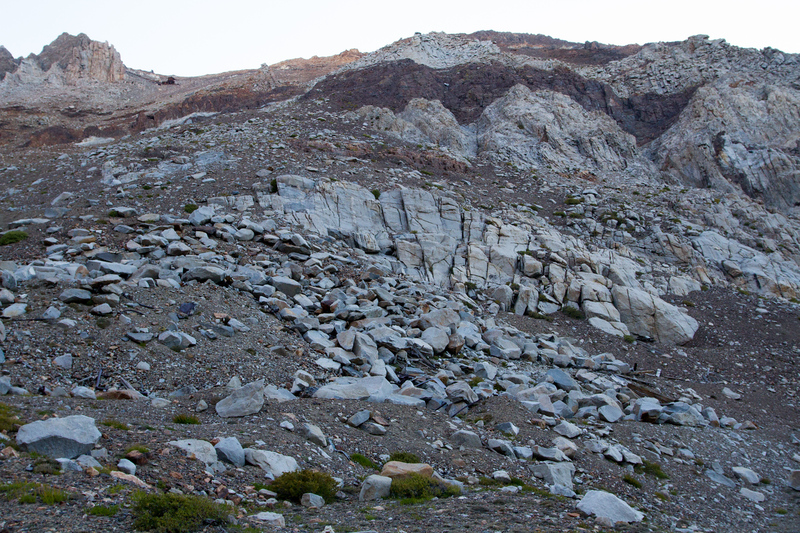 Starting out from the Mosquito Flat Trailhead. 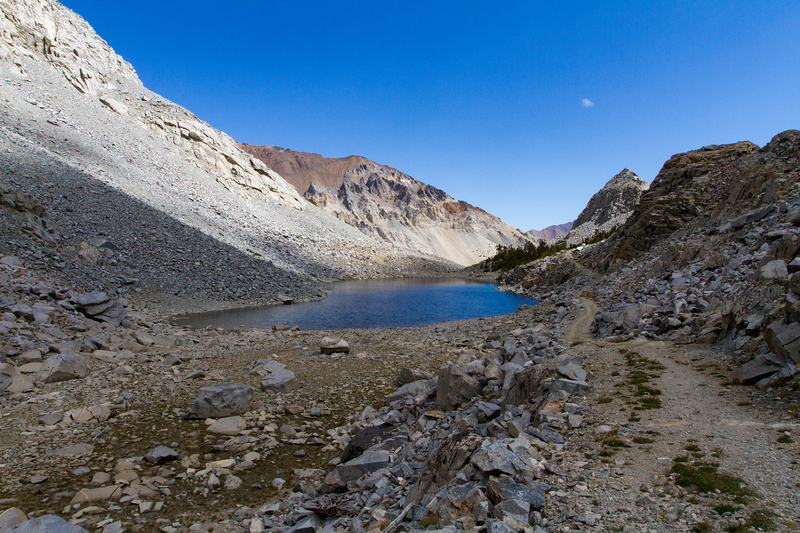 We reach Long Lake. 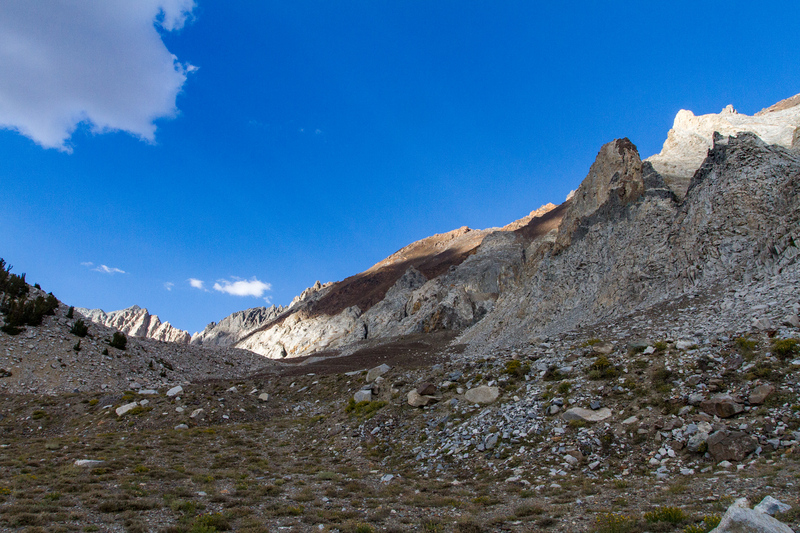 13,740' Bear Creek Spire, Pip-Squeak Spire and the Mt. Dade and Mt. Abbot massif (L-R) are in the background. 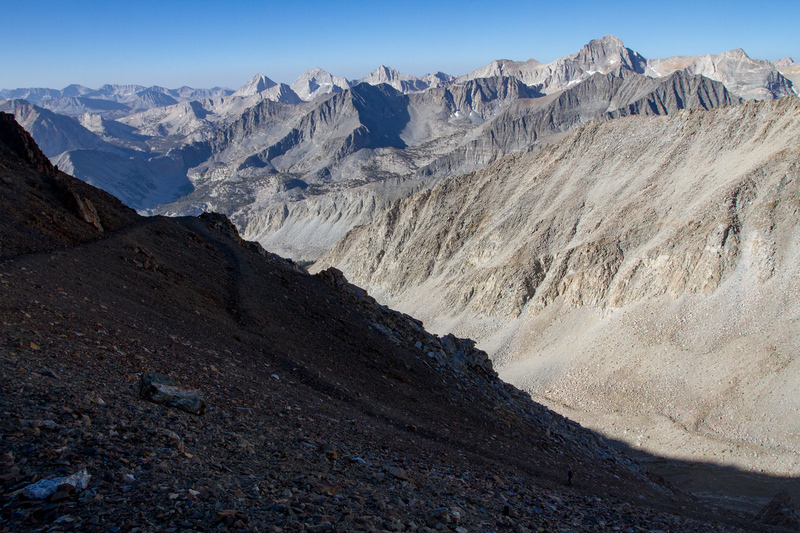 Approaching Morgan Pass at 11,120'. We spot the frame to some kind of truck. I'm guessing it was for mining. 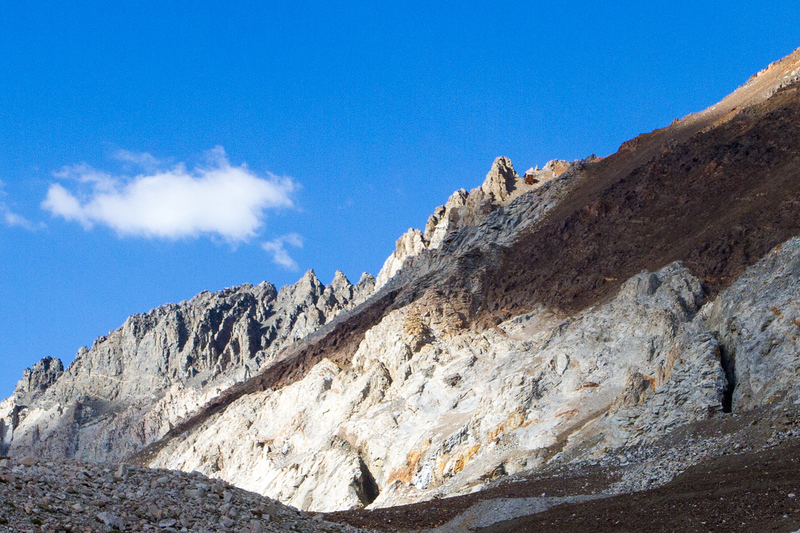 There are some jagged peaks here. 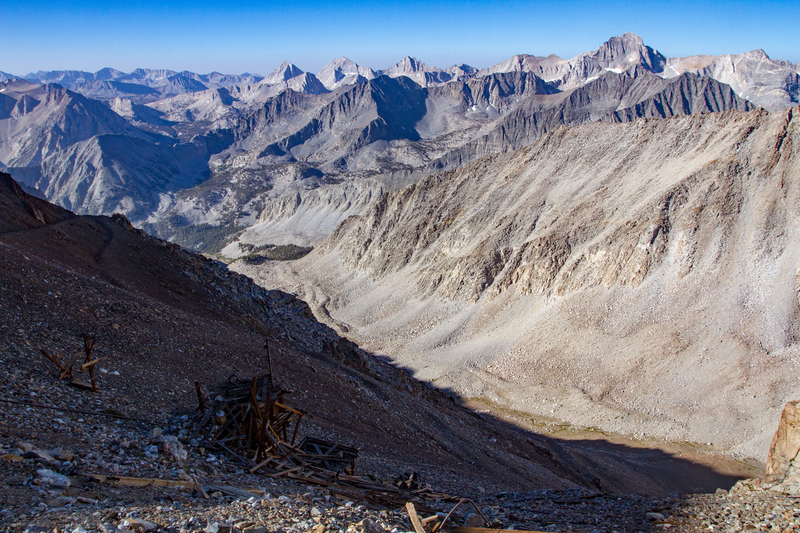 Looking back over Little Lakes Valley. 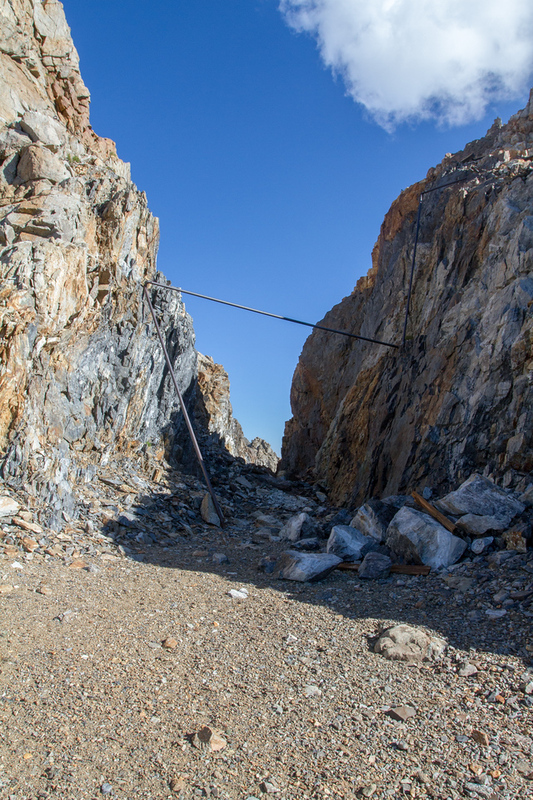 You can see this was once a road up to the mines. 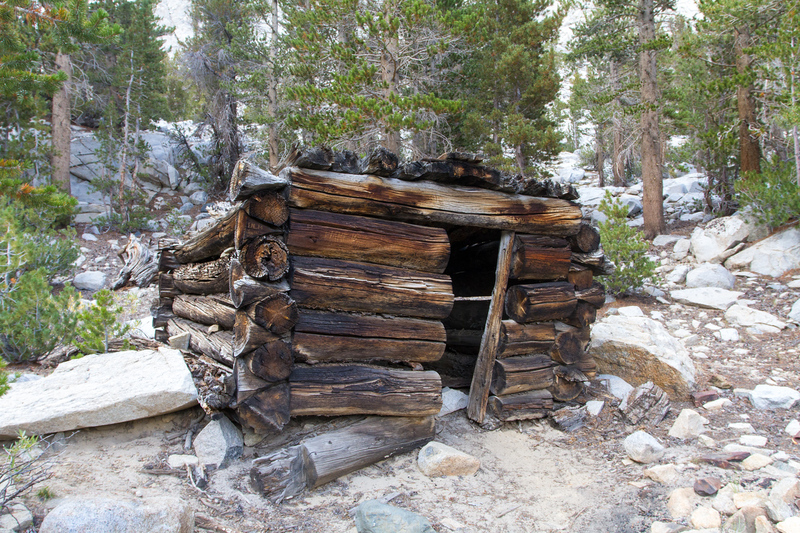 We find one of the remaining cabins at Lower Morgan Lake. 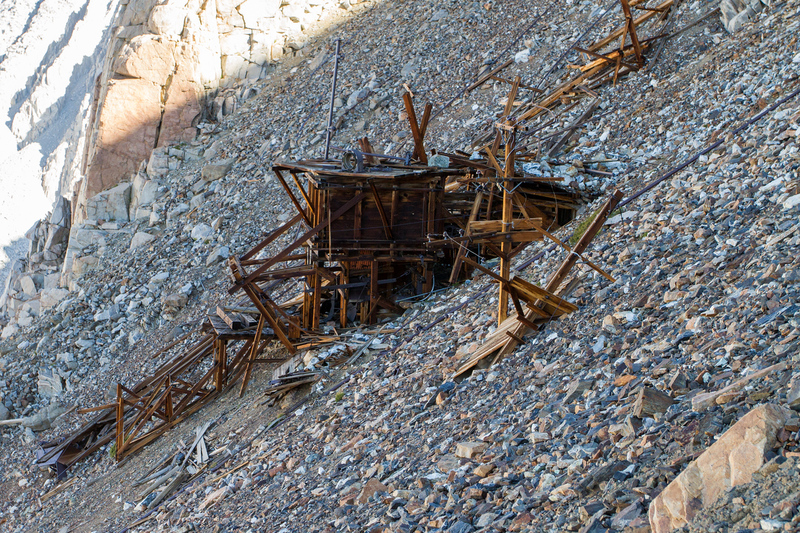 It was part of the appropriately named Lower Morgan Lake Mine. Looking across the Morgan Creek valley. 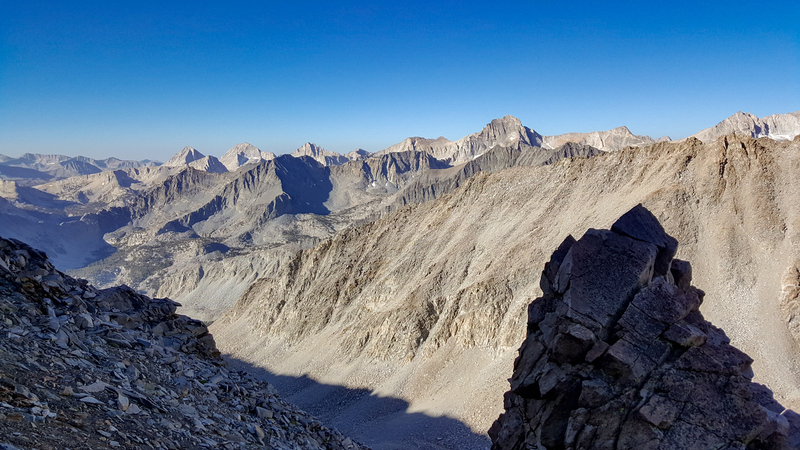 13,000' Wheeler Ridge. This is where we are going. 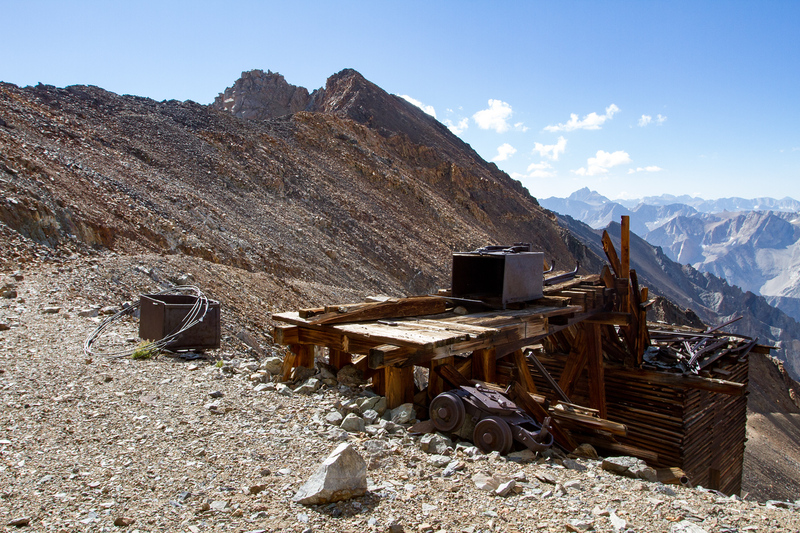 If you look close, you can spot the ore bin for the Adamson Mine. It is next to that spire in the center. 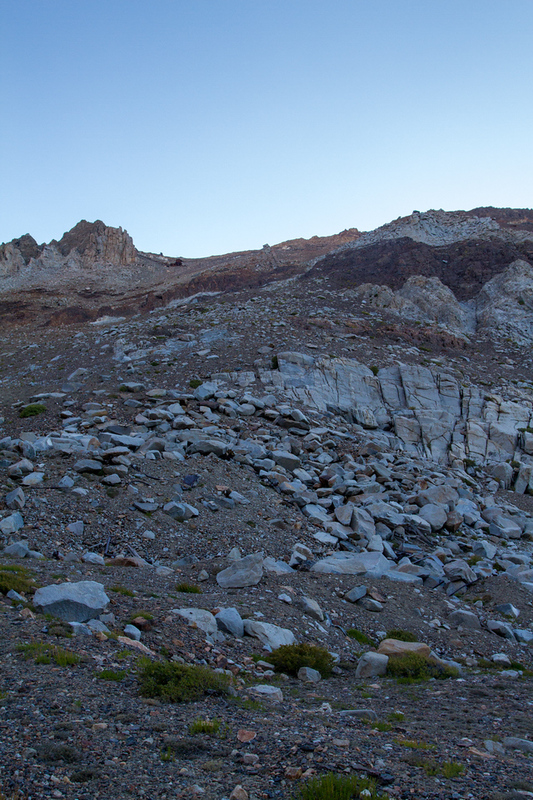 Panoramic from our camp area. 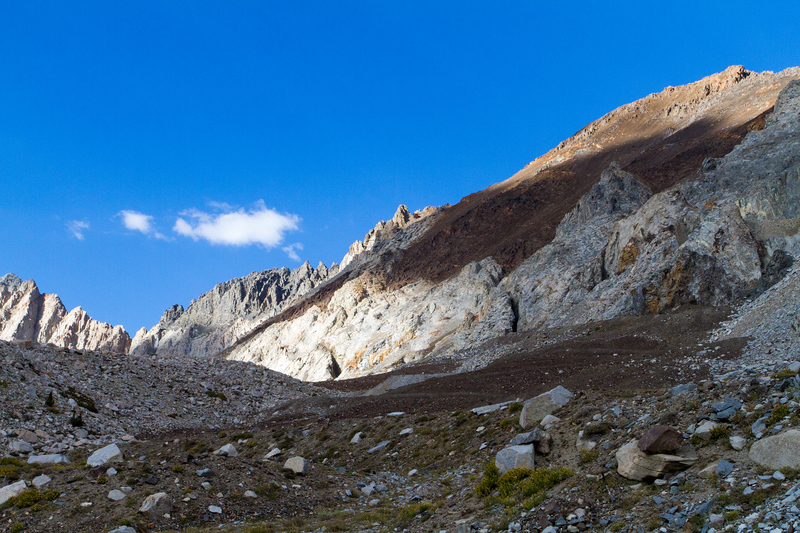 Morning light on 13,740' Bear Creek Spire. We started hiking under starlight. Old shoe. 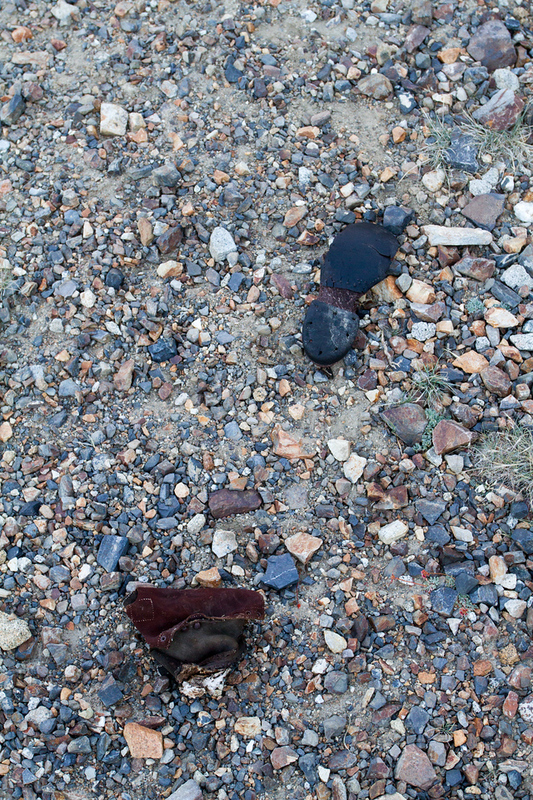 Probably from the last hiker... I mean, miner up here. 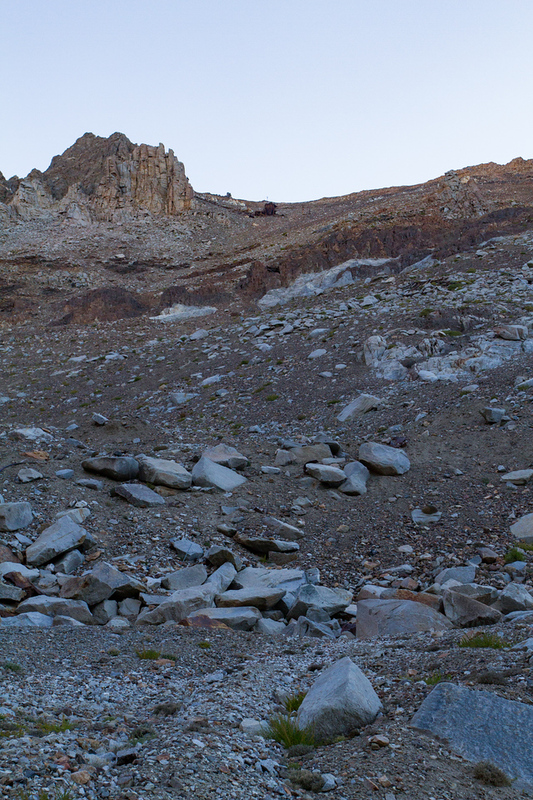 My morning stroll is shaping up to be a little more strenuous than normal... We are at about 11,700'. 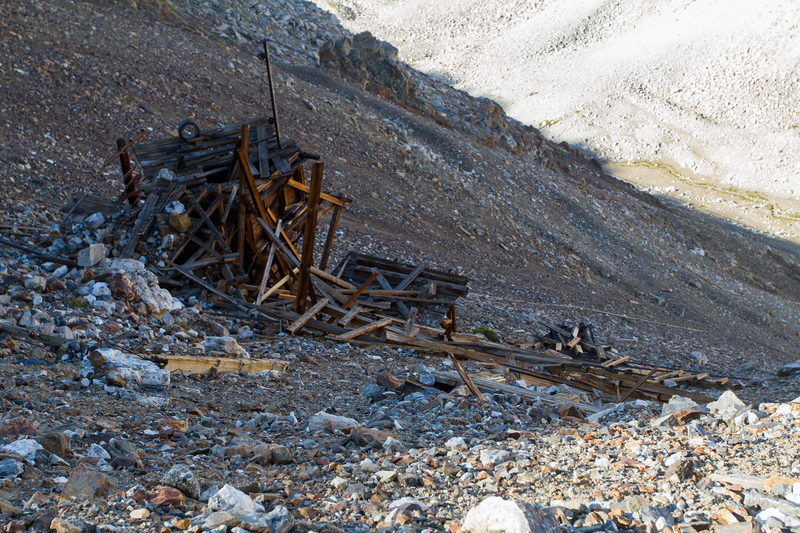 In the foreground is the remains of the lower tram house and mine camp for the Adamson Mine. They were destroyed by avalanche. It's hard to believe they put a road up this. 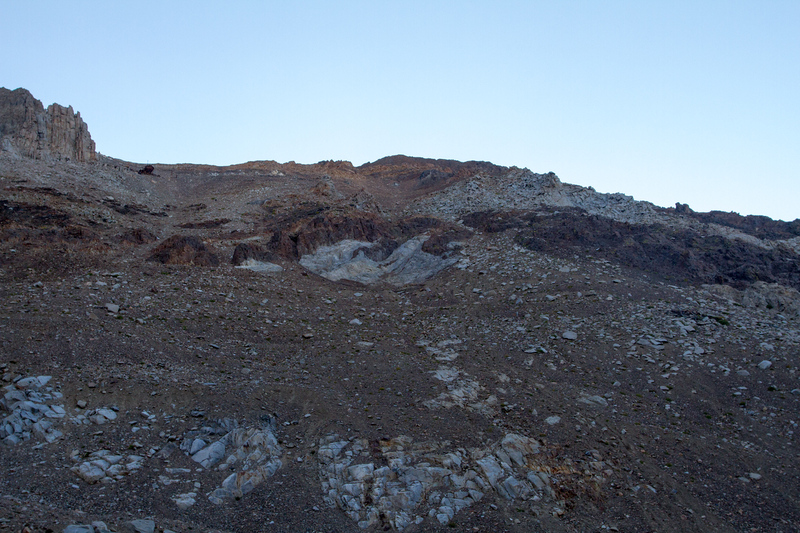 Much of it remains, although it is difficult to see in this view. 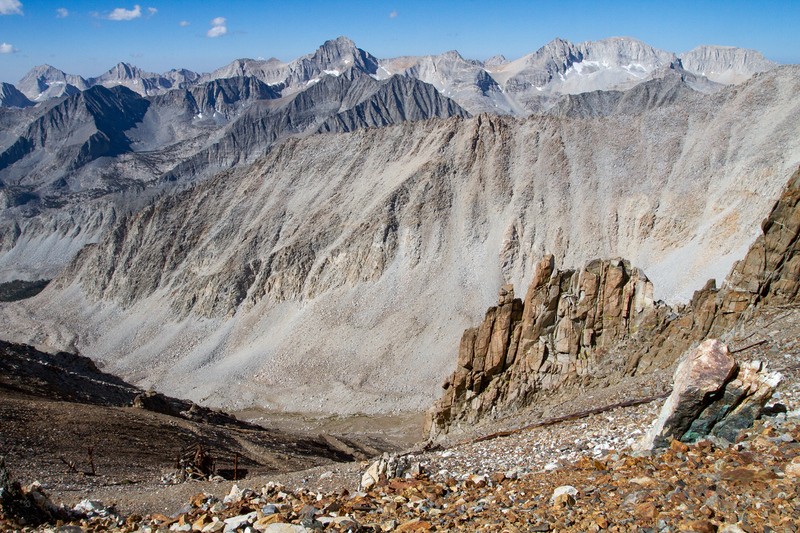 An endless sea of granite ridges and spires open up before us. 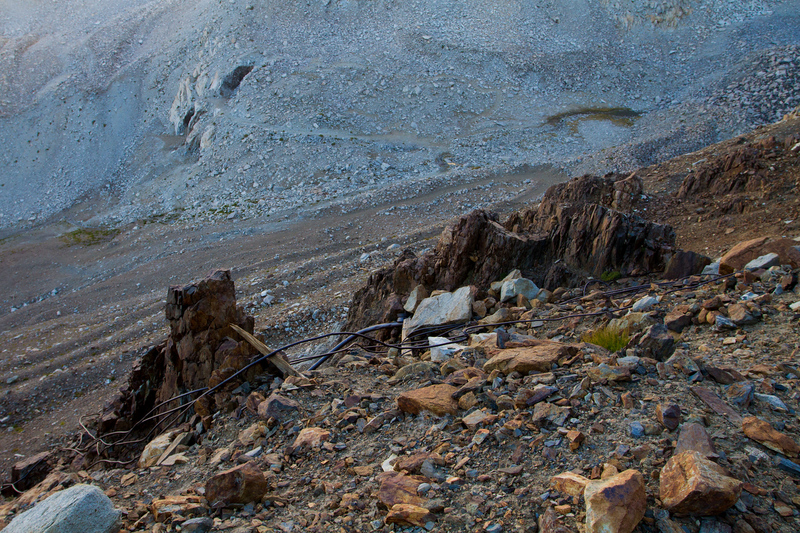 I believe that is 13,103' Merriam Peak on the right. 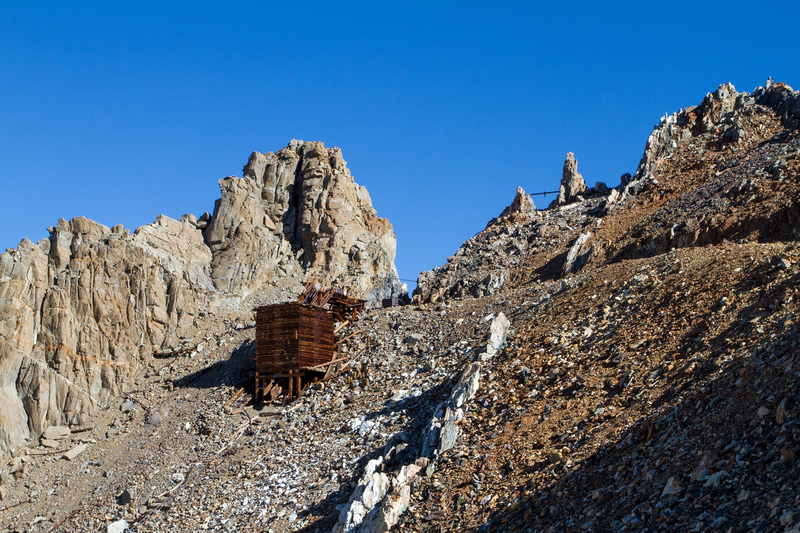 The ore bin of the upper Adamson workings is coming into view. It is indeed as steep as it looks. 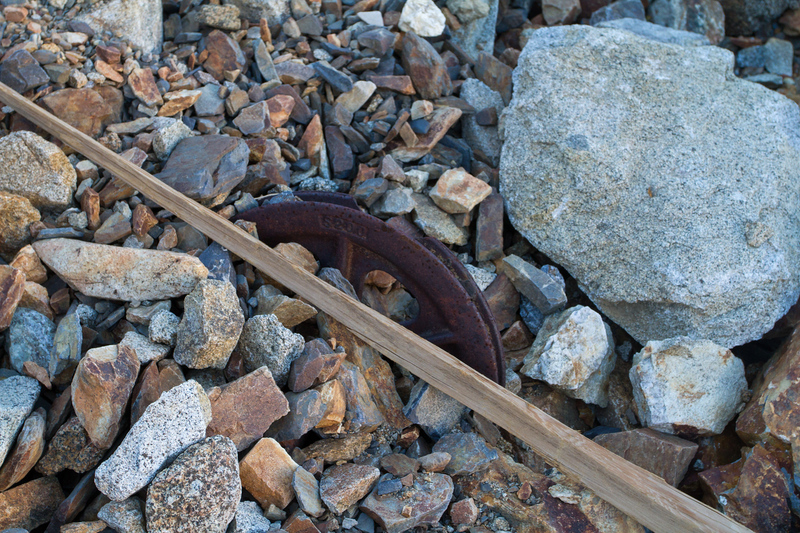 Old pulley wheel in the talus. Most of the trail is lost here. A view back down the valley. Merriam, Royce and Feather are the three spires in the distant right. 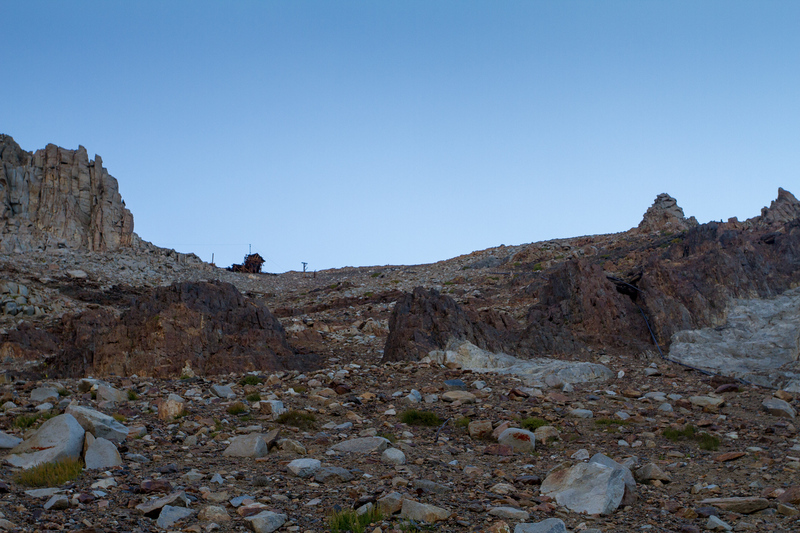 13,300' Royce Peak is the tallest but all of them are above 13,000'. 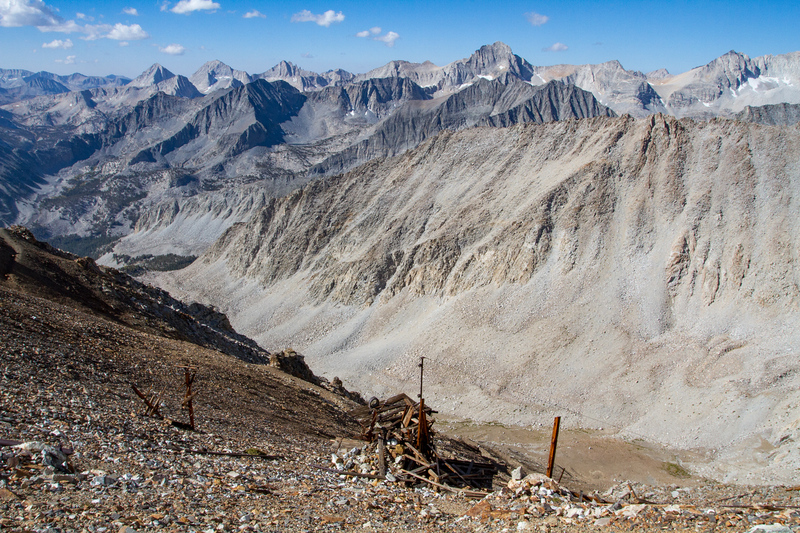 On the far horizon is the remote Glacier Divide. Closer to home, I pass some tram cables. It must have been quite a feat to haul them up here. And they had electricity! 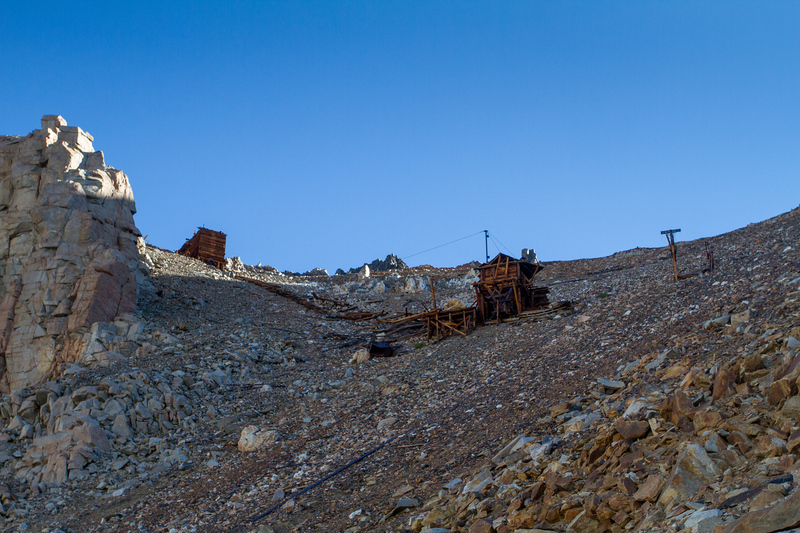 This was probably the highest electric power in the Sierras at the time. 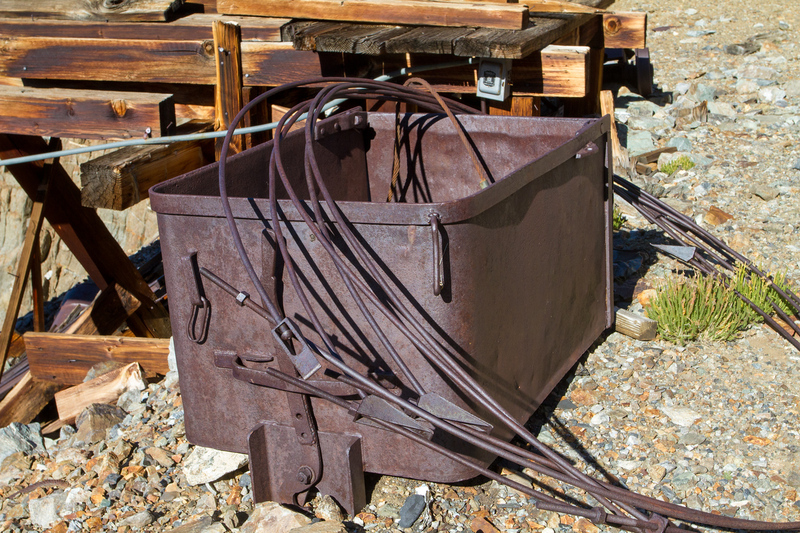 So it turns out there is an upper ore bin and a separate tram terminal. A trestle once connected them. 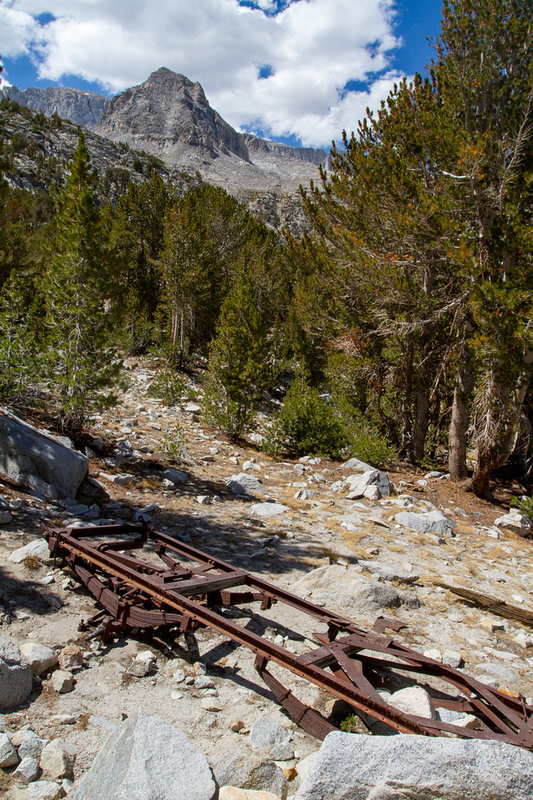 And, if you look close, there is a skip car resting near a white boulder at the tramway. A better look at the tram terminal and ore bin. 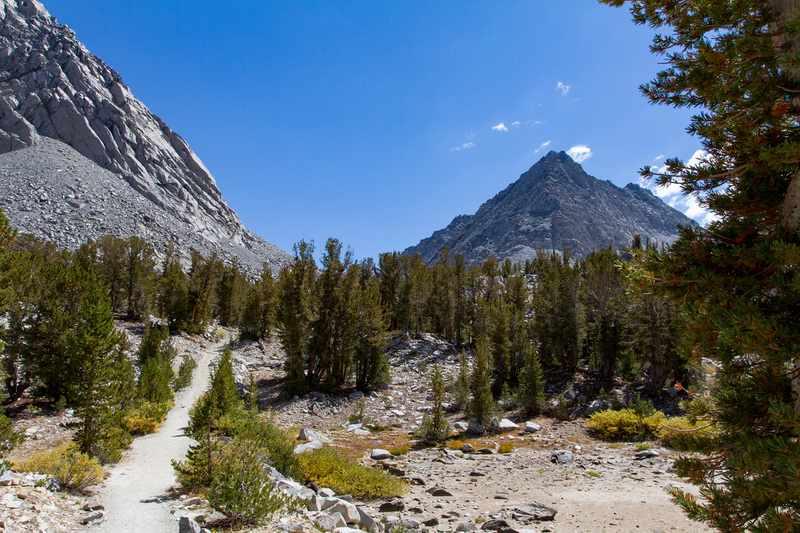 Bear Creek Spire dominates the landscape. The road is a little better up here but the air is still thin. 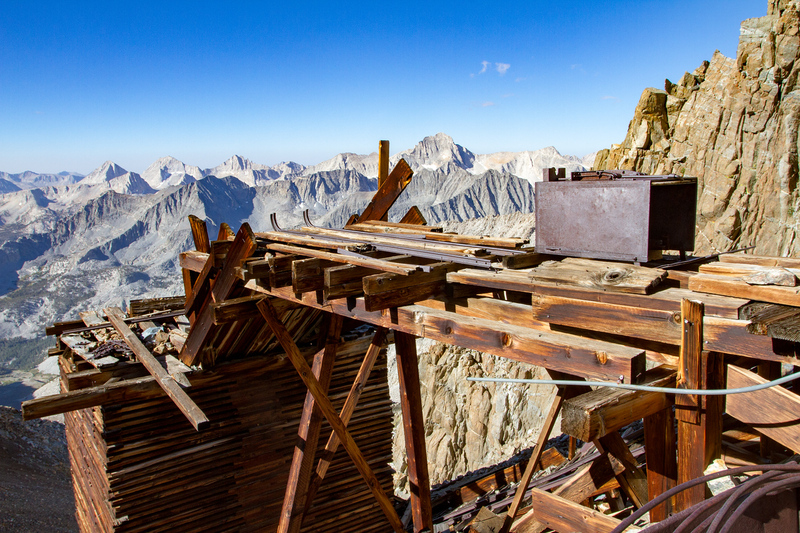 The miners had one heck of a view. I'm running out of gas right about now. Almost there though. You can see the remains of the trestle here. The tungsten ore body was worked in an open cut that goes right through the ridge. We are almost to 13,000' now. 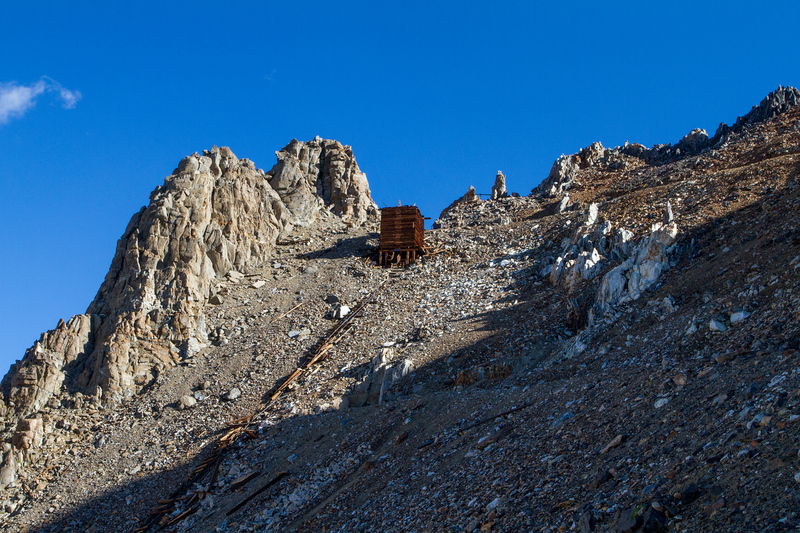 There are a couple of ore cars up there! This is one incredible view. Can you imagine working here? 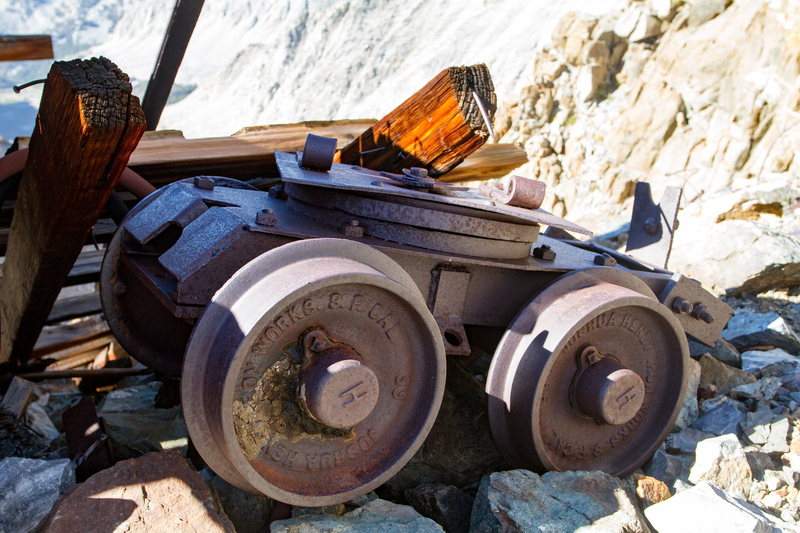 Wheels for one of the ore cars. Joshua Hendy. 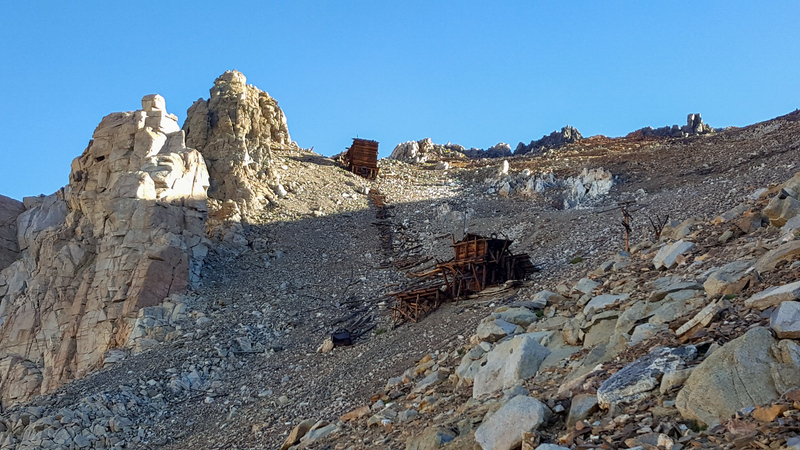 It must have been amazing to work this mine at the top of the Sierras. A look down the slope. It's a long ways down. On the other side of the ridge. 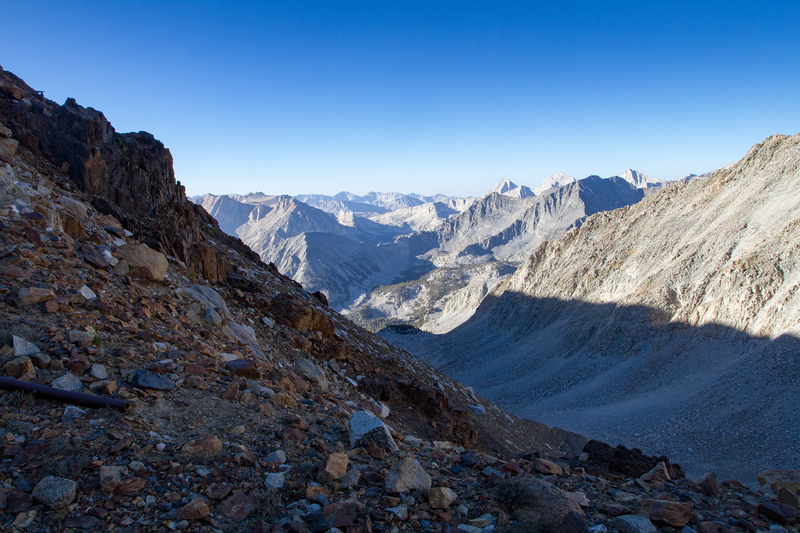 You can barely see Bishop through the haze down below. Myself at the ore bin. It is a heck of an effort to get up here. Now we have to climb down.